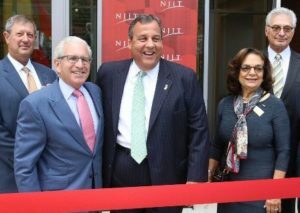 Governor Chris Christie helped cut the ribbon on the New Jersey Institute of Technology’s $19 million Life Sciences and Engineering Center, funded by $13.5 million in state Higher Education Capital Facilities grants, including Building Our Future Bond Act (GO Bond) funds. “The investments we have made in the last seven-plus years in our institutions of higher education will ensure they will continue to be a vital link to the economic growth and competitiveness of our state,” said Governor Christie. “This is an exciting time in biomedical engineering,” noted Treena Livingston Arinzeh, director of NJIT’s Tissue Engineering and Applied Biomaterials Laboratory, in pointing to the recent plethora of game-changing health technologies such as gene editing, cell therapy, nanoparticle technology and regenerative medicine. “But all of these approaches require multidisciplinary teams, coming together from disparate fields,” she said. The new center promises to provide those crucial opportunities. The four-story facility, which houses more than 20,000 square feet of shared laboratories and meeting spaces, IT infrastructure and cutting-edge scientific instrumentation, is designed to promote collaboration in fields ranging from biomedical engineering and the biological sciences to electrical engineering and healthcare technologies. Its mission is to build on NJIT’s increasingly transdisciplinary strengths in engineering and the life sciences — with a particular focus on biotechnology, biosensors and medical devices and nanotechnology — toward the development of new applications in clinical healthcare, therapeutic interventions and pharmaceutical drug development. By linking the experimental side of research with powerful computation, NJIT and its partners will feed data generated in the university’s laboratories into computer models and simulations that will, for example, be able to forecast molecular, cellular and tissue behavior for clinical applications. “The name “Life Sciences and Engineering Center” tells you how important the marriage of those two disciplines is,” Matthew Kyriakos ’10, (above) a Ph.D. student in biomedical engineering who researches traumatic brain injury (TBI), said at the ribbon-cutting. The new structure connects to the Otto H. York Center for Environmental Engineering and Science to form a cohesive complex that increases square footage by 57 percent and leaves room for a 47,000-square-foot expansion in the future. Additionally, a two-story atrium and presentation space provides opportunities for informal learning, gathering and teaching. The new facility also offers monumental stairs with seating, a new exterior plaza and a second-floor lounge area, giving students more options for cozy nooks in which to study, read and relax. It is part of an ongoing, $300 million capital building and renovation program that is transforming research, teaching and campus life at NJIT.